Summary: World war is on the horizon in New York Times bestselling author Brad Taylor’s tenth heart-pounding Pike Logan thriller. The Taskforce has stopped countless terrorist threats across the globe, operating outside of US law to prevent the death of innocents. But now, along the fault lines of the old Iron Curtain, the danger is far greater than a single attack. With Russia expanding its influence from Syria to the Baltic States, the Taskforce is placed on stand-down because of the actions of one rogue operator. Meanwhile, Pike Logan and Jennifer Cahill travel to Poland, hired to verify artifacts hidden for decades in a fabled Nazi gold train, only to find themselves caught amid growing tensions between East and West. A Russian incursion into Belarus under the facade of self-defense is trumped by a horrific attack against the United States, driving NATO to mobilize even as it tries to determine who is behind the strike. On the brink of war, Pike and Jennifer discover that there is a separate agenda in play, one determined to force a showdown between NATO and Russia. With time running out, and America demanding vengeance, Pike and Jennifer race to unravel the mystery before a point of no return is reached. Unbeknownst to them, there is another attack on the way. 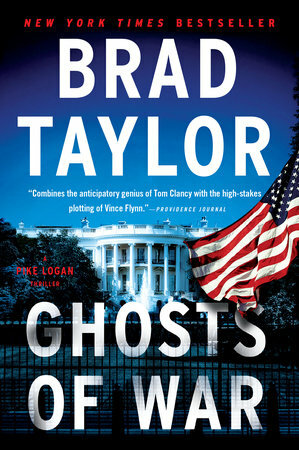 It's hard to believe that it's been almost a year since Booking Pap Pap reviewed GHOSTS OF WAR by Brad Taylor, the tenth novel in the Pike Logan series. At the time, he said, "GHOSTS OF WAR is a good mixture of military action, history and technology in a fast-paced suspense thriller with plenty of twists and turns that should interest readers of this genre." You can read his full review here. I've heard fantastic things about Brad Taylor and his novels. It seems like he definitely knows what he writes. Mr. Taylor served for more than twenty years in the US Army, including eight years in the 1st Special Forces Operational Detachment-Delta. Needless to say, he understands counter-terrorism and the reviews of his novels agree that he writes suspenseful and fast-paced thrillers! If you missed GHOSTS OF WAR the first time around, then you are in luck because the paperback version is being released today! Thanks to the fine folks at Dutton, I have a copy of the newly released paperback to share with one lucky reader. To enter, just fill out the form below before Monday, September 11th at 11:59 p.m. EST. I will randomly select and notify the winner the following day. This contest is open for those of you with U.S. addresses only. Good luck!